As our new most comfortable mat, the SOFT has crushed pieces of natural amethyst, jade, and tourmaline ceramic. As you lie on the stones they conform to your body shape, unlike solid flat stones. Choose a SOFT mat and put comfort first. 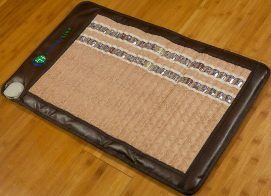 At 32” x 20” you have a medium mat sized to fit your entire torso or legs or target specific areas of your body. It is comfortable, can be rolled and is shipped folded. Use it on the floor or on top of your bed.